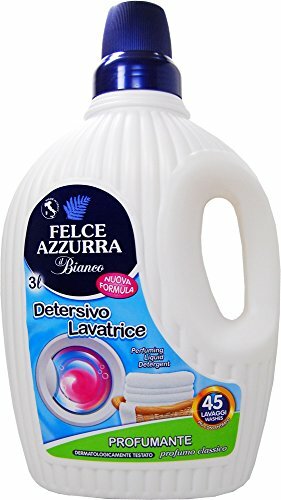 Perfuming washing machine detergent â€" 3 L (40 washings guaranteed!). It is a specific liquid detergent for washing machine laundry. Thanks to its active formula gives to the cloths a shining cleaning, leaving on the laundry a pleasant fragrance, the Classic Felce Azzurra. It is suitable for every type of fabric and it is effective against every spot, already at 30Â°C, allowing a large energy saving. The dermatologically tested formula respects the hands skin and cuddles the laundry, scenting it thanks to its unmistakable perfume. If you have any questions about this product by Felce Azzurra, contact us by completing and submitting the form below. If you are looking for a specif part number, please include it with your message.